We’d love your help. Let us know what’s wrong with this preview of Bowl by Lukas Volger. To ask other readers questions about Bowl, please sign up. This book is about making vegetarian meals gathered together in one eating bowl. Bowls are basically: grain + veg + protein + condiment(s). This book mainly focuses on Asian-end recipes, so it's probably good to have another bowl-meals book to have more variety. Eggs are featured in many dishes, but I feel you could replace it sometimes with soft or firm tofu (if tofu is not already included), or just leave it out. There are photographs for many of the recipes, and tips and smaller recipes scatte This book is about making vegetarian meals gathered together in one eating bowl. Bowls are basically: grain + veg + protein + condiment(s). This book mainly focuses on Asian-end recipes, so it's probably good to have another bowl-meals book to have more variety. Eggs are featured in many dishes, but I feel you could replace it sometimes with soft or firm tofu (if tofu is not already included), or just leave it out. There are photographs for many of the recipes, and tips and smaller recipes scattered among them. Bowl include ramen, pho, bibimbap and dumplings-including... there's even one rutabaga dish (odd to me because in my country rutabaga is commonly encountered mostly in dessert soups, with strawberries). Each recipe has some of the main ingredients listed under the title, which is useful. First comes a chapter on tools and ingredients (some food brands mentioned, and the author recommends using farmers' markets, if possible). Then come bowls by type: wheat noodles, rice noodles/rice, grain, dumpling. This is followed closely by recipes for certain basics and components (like stock, rice, eggs, kimchi, noodles from scratch, sauces) - I feel these could be useful in recipes outside the book, if you're looking for vegetarian versions of some esspecially - and finally there some online sources for bowls and ingredients. Spring ramen, Vegetarian kimchi ramen, Summer ramen, Mushroom soba noodles, Vegetarian curry laksa, Cold kimchi noodes, Cold ramen, Zucchini soba noodles, Spring pho, Cold rice noodle salad, Spicy tofu bibimbap, Kimchi fried rice bowl, Ratatouille polenta bowl, Veggie burger bowl, Cauliflower 'couscous' bowl, Toasted bulgur bowl, Edamame dumplings, Leek shumai, Spicy carrot dumplings, Napa cabbage and peanut shumai, Kimchi dumplings, Rich lentil dumplings. Biggest peeve....not enough pictures in a cookbook. Many times we eat with our eyes. Personally, I think cookbooks should have a photo for every single recipe. But I know that can be a bigger cost. There are pictures in this book, but not enough. Sometimes a recipe sounds quite good, but reading the details it seems so overwhelming and I see myself in the kitchen for many hours. I decide against it. But if there was a picture....I would stick with for many hours because it LOOKS so mouthwatering Biggest peeve....not enough pictures in a cookbook. Many times we eat with our eyes. Personally, I think cookbooks should have a photo for every single recipe. But I know that can be a bigger cost. There are pictures in this book, but not enough. Sometimes a recipe sounds quite good, but reading the details it seems so overwhelming and I see myself in the kitchen for many hours. I decide against it. But if there was a picture....I would stick with for many hours because it LOOKS so mouthwatering. Beautiful photographs of delicious looking meals. The recipes are clear and easy to follow, all vegan. I made 6 different recipes, all were good but not great. They all lacked flavor for my family's palate. I double and tripled the spices in a couple and it was perfect. I'd recommend it as a basic book as long as you know it is under spiced. Alright, so this dude has a little bit of the organic hipster Brooklyn sickness, but that doesn't take away from the quality of this cookbook's concept and execution. I'm particularly down with his choice to have a spring/summer/autumn/winter version of most of the main recipes (ramen, pho, bibimbap, dumplings) - it's a good way to try to teach readers about variations on a theme. Having a basic recipe down and improvising bas Alright, so this dude has a little bit of the organic hipster Brooklyn sickness, but that doesn't take away from the quality of this cookbook's concept and execution. I'm particularly down with his choice to have a spring/summer/autumn/winter version of most of the main recipes (ramen, pho, bibimbap, dumplings) - it's a good way to try to teach readers about variations on a theme. Having a basic recipe down and improvising based on seasonal ingredients is a winning strategy for making your learning stretch as far as possible. Awesome cookbook. Great motivation for easy and delicious breakfasts, lunches, and dinners - all year round. Ever since I was little, I've been obsessed with Asian food. It started out with a love of Americanized Chinese cuisine, but my tastes have grown to encompass Thai, Vietnamese, Cambodian, Korean, Filipino, and Japanese foods and more. So when I had the chance to pick Itadakimasu! 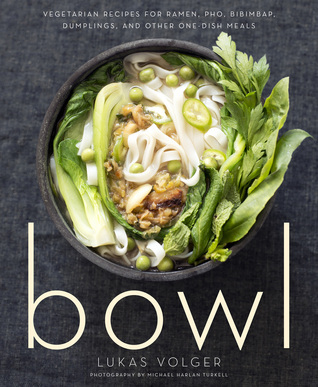 So when I had the chance to pick up Bowl, a cookbook devoted to Asian meals that come in a — you guess it... bowl! — I jumped. Not only did I want to learn new techniques for my at-home cooking, I wanted to learn more about the food cultures that I love so much. Any cookbook that teaches me so much is A-plus, "O" for "Outstanding", and 5 stars in my opinion! One thing that disappointed me slightly was that the cookbook was vegetarian. I would have liked to learn how to incorporate more protein into these dishes. But ultimately, that's a quibble. I've read and reviewed a number of cookbooks in the past two years, and Bowl is hands-down my favorite yet. It has great organization, beautiful images, unique focus, wonderful tips, and solid recipes. I'll be pulling out Bowl for reference and reading for many years to come. It makes me so sad to have to give this book such a low rating, it really does. Bowl is a beautiful cookbook with unique and inventive recipes and photos, that entice the eater from the get-go. Thumbing through its pictures the author makes eating vegetarian look so tantalizing that you find yourself thinking, "Yeah, I could totally go veg." Unfortunately, for me, that was where the book's appeal ended. I wanted to love this book so much. I love meals in bowls, I love Asian cuisine (which is most It makes me so sad to have to give this book such a low rating, it really does. Unfortunately, for me, that was where the book's appeal ended. I wanted to love this book so much. I love meals in bowls, I love Asian cuisine (which is most, but not all of the book,) and the images alone leave you drooling over the umami that is sure to await you within these recipes. But every recipe I tested fell short, and it makes me so very sad to say that. Despite the variety of ingredients and the uniqueness of their compilation, every recipe I tested came away bland. Perhaps it was the quality of my ingredients--maybe they have better ingredients in New York. Perhaps it is the nature of vegetarian cuisine (although I have been eating mostly vegetarian for 4 months now and I haven't found that to be the case.) I'm not sure what "it" is really, because vegetables and ingredients that on their own are delicious somehow seem to downgrade in flavor with each of these recipes which such a weird thing to have happened. i totally got suckered into this cookbook by the photography, which is stunning. i copie i totally got suckered into this cookbook by the photography, which is stunning. i copied down the mujadara bowl (p154), the pesto (p163), and the the stir-fried bok choy and rice (p208) recipes to try out in the future (i did not realise until now that i would love to learn to make my own pesto), but everything else was just a bit too high-maintenance for me. It's beautiful--love the pictures. I was looking for ways to get healthier meals on the table, with less reliance on processed and prepackaged foods. And this book sounded perfect for my half-Asian family. However, too many of the recipes called for 20+ ingredients, several of which had their own recipes elsewhere in the book. I need something a lot quicker and easier than that. And hydroponic lettuce? I've never even seen that in any of my local grocery stores and I doubt that it would be in my It's beautiful--love the pictures. I was looking for ways to get healthier meals on the table, with less reliance on processed and prepackaged foods. And this book sounded perfect for my half-Asian family. However, too many of the recipes called for 20+ ingredients, several of which had their own recipes elsewhere in the book. I need something a lot quicker and easier than that. And hydroponic lettuce? I've never even seen that in any of my local grocery stores and I doubt that it would be in my price range anyway. Interesting recipes for a bored cook. A great introduction to 'bowl' eating with authentic tasting recipes and fresh ideas. We use it frequently now, especially in the summer when we are overflowing with fresh veg. It isn't just 'soup', it's much more. I really like having it all in one large bowl, easier to eat, easier to create, easier to clean up and it melds the flavors together in a way that you cannot get with a '3 squares' on a plate. The Summer Ramen broth recipe has become my go to broth Interesting recipes for a bored cook. A great introduction to 'bowl' eating with authentic tasting recipes and fresh ideas. We use it frequently now, especially in the summer when we are overflowing with fresh veg. It isn't just 'soup', it's much more. I really like having it all in one large bowl, easier to eat, easier to create, easier to clean up and it melds the flavors together in a way that you cannot get with a '3 squares' on a plate. The Summer Ramen broth recipe has become my go to broth. I make it in large batches and use it everywhere a recipe calls for broth or even water (as in making rice or other grains). When used in place of water for grains it really punches up the flavor and nutrition profile. Whilst the dumpling folding is a bit tricky if you want more than a half moon or triangle, the flavours of the finished dumplings are divine. I bought the book after noticing the beetroot and tahini dumplings and have also tried the pumpkin with fennel and ginger. I'm looking forward to trying the kimchi ones next... The dumplings freeze perfectly and steam from frozen in 5 minutes so are perfect for quick fix dinners. I've made lots of these bowls, and used his ideas to create many of my own. This cookbook brings forward asian based recipes that are simple and delicious. Bowls, bipinbap, pho etc are gaining in popularity and this book shows you how to make them. Great resource. Loving this cookbook - has inspired me to make a few Bowl meals lately. Definitely one of the better ones I've tried recently. I'll be buying the paper version (I read this via Kindle Unlimited). Really awesome and most recipes can be veganized! A great book on just fun foods. Great for techniques and basics of ramen, especially for vegan soup base. Creative lesson with excellent illustration. Wonderful. This is one beautiful book. I read it through a 2nd time for cookbook club, and this time I attempted the 'Autumn Ramen'. From making my own dashi to roasting mushrooms, and much more, it turned out pretty tasty. It was many more steps than i'm used to, but worth it in the end. Also tried the wonton soup which was great. May try a few other dishes. I have no cookbook like this! I do not know how frequently I will use these recipes, but my daughter and I are eager to try out some. Also, basics and tools are heavily discussed which is a big plus too. In 2016 we all rediscovered that bowls are good for more than just soup, cereal and haircuts. Bowl gives you a convincing argument for throwing away your plates and embracing a bowlful lifestyle. made the rutabaga fried rice, chickpea dumplings and the springtime pho....all very tasty, but a lot of work for someone who doesn't know how to cook this kind of stuff. i guess now that i know some of the basic techniques and ingredients it could go smoother. would i make more? eh...probably not. i'd rather go to the restaurant and pay someone else make this kind of stuff for more. overall, nicely done well written, but needs more photos. Vibrant, nutritious, and packed with flavor, these recipes will wow vegetarians and carnivores alike. I look forward to cooking my way through this book and benefitting from the technique tips scattered throughout. One note: I used the recipes as a foundation, often tweaking ingredients and spice level to suit our tastes. Unique vegetarian recipes that I would order every day in a heartbeat from a restaurant, but am less inclined to cook on my own with unfamiliar ingredients that require packaging and processed foods. May try to tackle one someday, nonetheless. Great buy. Exactly what I hoped for. The recipes are clearly explained. I feel confident enough to switch ingredients for my own inspired creations.